Orea Hotel Dvoak TaborThe Dvorak hotel is situated in the historic centre of the town of Tabor. The hotel was established in 2004 thanks to a recent, very interesting reconstruction of the historic building once housing the Tabor brewery, located right next to the remains of the Kotnov Castle of the 14th century. Newly open Tabor Treasure Exhibition is also placed on the premises. The hotel offers 72 luxury rooms with 139 bets and possibility of extra sofa beds. All rooms are equipped with satellite Tv, direct-dial telephone, safe box, mini bar, internet connection and bathroom with bath and WC. Food services - Buffet breakfast, Lobby bar, Summer terrace with barbecue, Catering service. 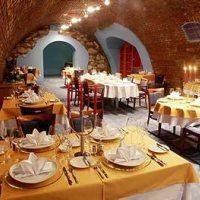 Restaurant La Cave kitchen is led by Chef of cuisine Martin Svatek - Member of Czech national team cooks and pastry cooks. In the restaurant meals are prepared in modern style, high standard cuisine. Relax services - a small indoor swimming pool with back flow, whirpool, sauna and massages. Hotel service save parking capacity up to 120 places (outdoor, hotel garage), room service, exchange and secretarial services, internet point, supplementary sale, complementary guest service (e.g. tiket reservation, guided tours, taxi, theme programmes tec. ).